JABBER produces nonsense words that sound like English words, in the way that the portmanteau words from Lewis Carroll's Jabberwocky sound like English words. When a letter comes into contact with another letter or group of letters, a calculation occurs to determine whether they bond according to the likelihood that they would appear contiguously in the English lexicon. 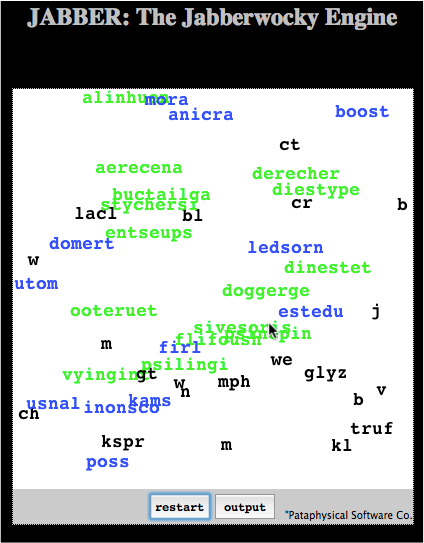 Clusters of letters accumulate to form words, which results in a dynamic nonsense word sound poem floating around on the screen with each iteration of the generator. JABBER realises a linguistic chemistry with letters as atoms and words as molecules. 2. Green words are compound words created from two blues ones. 3. Red words are garbage words that will explode. 4. The output button will toggle a text box containing all words produced by the generator. To get rid of the output box, hit the output button again and it will disappear).